What Happens If a Recruit Can't Make It Through Boot Camp? Every year, there's a small percentage of U.S. military recruits who don't progress past basic training, otherwise known as boot camp. In many ways, this is probably for the best; for those who can't complete boot camp, a career in the military is likely going to be a poor fit. Better to learn this early on. All branches of the service report a variety of reasons for recruits dropping out of boot camp. 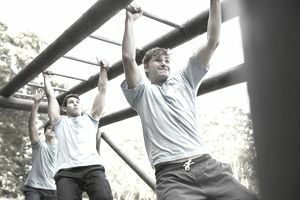 Some recruits aren't able to complete basic training for medical reasons, and some can't get past the endurance tests that require demonstrations of physical strength. Others aren't able to handle the mental demands of boot camp. This is why it's important to disclose any mental or physical illness before enlisting because the chances that it will be discovered or revealed during boot camp are pretty high. The branch with the lowest basic training attrition rate, according to figures from the Department of Defense, is the Air Force, which only sees between 7 and 8 percent of its recruits drop out after boot camp. The Navy, Army, and Marines have recruits drop out at roughly the same rate as each other, between 11 and 14 percent annually. Contrary to what many think, the goal of officers in basic training isn't just to push recruits to drop out. It costs the Department of Defense time and resources to recruit and train new personnel, so officials watch attrition rates carefully, to determine whether any changes or updates to basic training procedures need to be made. A higher-than-average attrition rate may signal something is not working. Barring a physical or mental impairment, would-be recruits can try to get in condition before they enlist, so when they get to boot camp they're at least somewhat prepared. Learn what the physical requirements are for the branch of service you want to join, and try to get in shape. Be warned that even if you're in top physical condition, boot camp training is rigorous and difficult beyond most recruits' expectations. Recruits who decide early on in the boot camp experience that the military is not for them are best-advised to seek a discharge known as an entry-level separation (ELS). There's no guarantee that a recruit seeking an ELS will receive one, but it's worth a shot for those who are really sure. And for those who want to try to "game" the system, be warned: You're not likely to get out of boot camp just because you fail a given part of your physical endurance tests. The non-medical "recycle" rate, meaning those recruits who get more time in basic training, is about the same as the dropout rate. The worst option for someone trying to get out of boot camp is going AWOL, meaning absent without leave. Once you've signed your recruitment contract, you're legally bound to the military. A recruit simply walking away from the military is considered desertion, which carries a criminal penalty.